KAMVAS GT-156HDV2 has the same 8192 levels of pressure sensitivity. 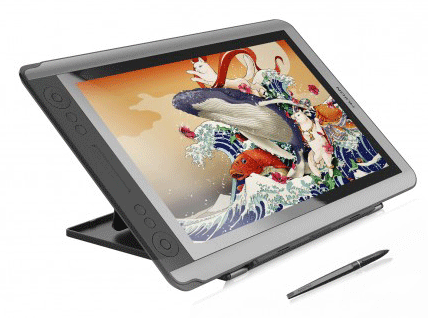 The 15.6 inches screen will provide you with a good drawing space compared to the smaller pen displays, while still being small enough to be carried around with some efforts. 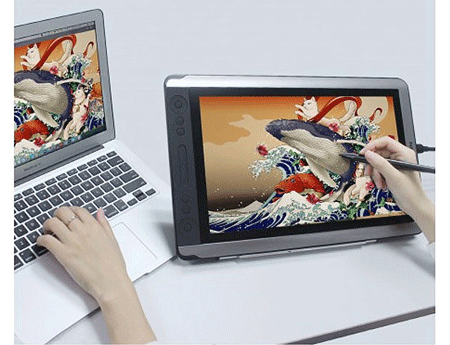 The screen resolution of 1920 X 1080 is high enough for drawing. Since KAMVAS GT-156HDV2 is compatible with HDMI there won’t be much of issues connecting it to any modern computer, including any computer with a display port that can be converted to HDMI, like USB-C, Displayport & mini Displayport. The only time this may be an issue is in case you only have VGA port in your computer. I honestly don’t know if workaround solutions would work if you’re in such situation. Colors may not be KAMVAS GT-156HDV2’s strongest point, especially with the 72% color gamut, which is around, this is considered normal color gamut, and unless you work in an environment where colors are super important, you won’t have to worry much about this. Having many hot keys (12), as well as a touch bar for zooming in & out the canvas (you can customize it to do other things if you like). While the stand that comes with KAMVAS GT-156HDV2 doesn’t allow you to adjust it to multiple angles, it’s good enough for many uses. Some artists may still not like it. It’s worth noting that KAMVAS GT-156HDV2 doesn’t support VESA mount, so you can’t mount it to an arm out of the box. KAMVAS GT-156HDV2 is very similar to Gaomon PD1560 (reviewed here), so you may want to look at it if you want to see various options. A very affordable pen display to draw intuitively on computer. Has hot keys, and many of them, something the bigger Huion KAMVAS GT-191 did not. Is relatively portable at this size. The colors may be a bit off, but you can adjust them a little bit. You may encounter some driver & installation issues when you use it for the first time. Accessing the OSD mode is not intuitive in this pen display, so some artists may not notice you can adjust the display options. Some artists may not like the stand that comes with KAMVAS GT-156HDV2. 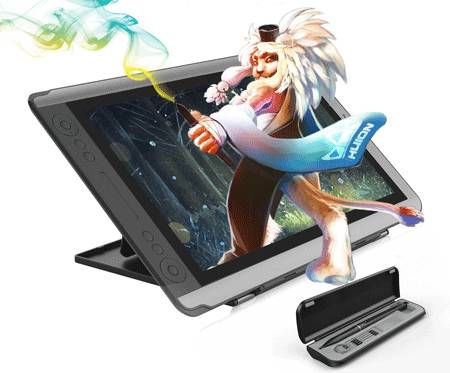 For a close amount to the price of KAMVAS GT-156HDV2, you can get the larger Huion KAMVAS GT-191, which provides more drawing area & better stand (but you get no hot keys, if you care about that). LCD panel type:- IPS LCD. 14 hot keys and touch bar to customize to your heart content (12 hot keys + a touch bar). Comes with a 3-in-1, which can help you get rid of cable clutter. Comes with two pens, which can be useful in case one of them is lost. Compatibility with Windows:- Windows 7, Windows 8, Windows 8.1, Windows 10. Compatibility with Mac:- Compatible with Mac OS / Mac OS X 10.11 and above. Let’s start the review by talking about the screen, since that’s what you are going to look at while you draw with KAMVAS GT-156HDV2. The resolution of the screen is 1920 X 1080, or HD as it’s also called, that’s the maximum resolution you get from Cintiq alternatives these days. 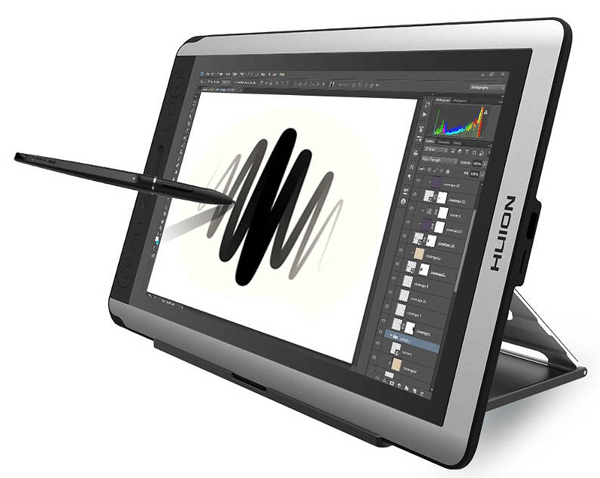 I pretty sure Huion & other Wacom competitors will produce pen displays with higher resolution like 4K in the future, but you will be fine with this resolution for the most part. It’s worth mentioning that KAMVAS GT-156HDV2 has a matte screen, unlike similar pen display, which gives you a matte surface using a protector you could remove if you like. The biggest advantage of a matte screen is how less reflective it can be, making it better for use outdoor, as the screen won’t act like a mirror when so much light fall on it. KAMVAS GT-156HDV2 only supports HDMI display port, which makes it compatible with a lot of computers nowadays. 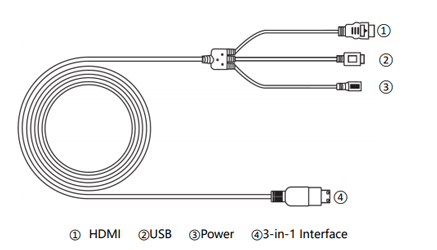 Even computers with different ports like USB-C, Displayport or mini Displayport can be converted to HDMI, you just need to get an adapter for that. The only issue is for the computers that only have VGA port (the blue one), even then you can get that port from some docks or other workaround solution, but I honestly don’t know how well that will work. If your computer only has VGA port, then I suggest you check out the larger Huion KAMVAS GT-191 (reviewed here), which support VGA port out of the box, and it’s very similar to KAMVAS GT-156HDV2 in many aspects. It also provides you with larger drawing area & better stand for a similar price, albeit you will get no hot keys in case you care about that. Colors from KAMVAS GT-156HDV2’s screen may not be the best you could see from a pen display, but they’re good enough. Adjusting them a bit using the OSD options can make them way better (more on how to access the OSD later). If you just want a pen display to draw naturally on, this won’t be a big of an issue here. From the specifications, you can see the color gamut is 72% NTSC. This is a different but a color gamut (or color range to put it simply) than Adobe RGB, this color gamut is kinda close to that of Cinitq 13HD, but it’s much lower than the newer Cintiq models, which feature color gamut of Adobe RGB above 90. I am not saying the colors of KAMVAS GT-156HDV2 are bad or anything, they’re more than enough for most people. 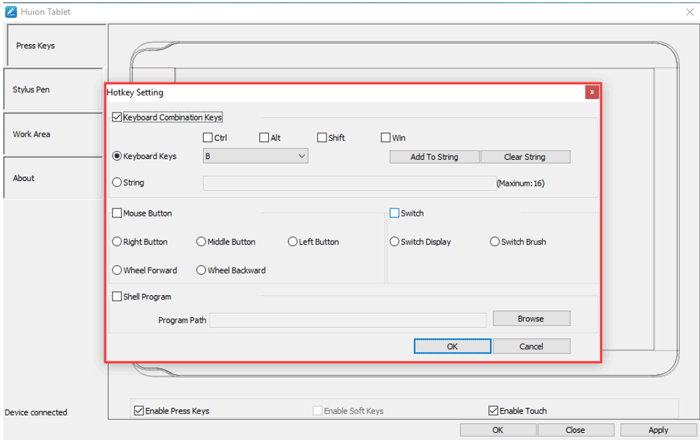 To adjust the colors & other things, you can adjust OSD using the hot keys, to do that, press & hold the middle key to activate OSD mode (see the picture below). Once you’re in that mode, the other 4 buttons in the circle turn into Auto, Plus, Minus & Menu buttons. Pressing the middle button for 5 seconds again close the OSD mode. Using the OSD Not very intuitive, so some artists may miss that. 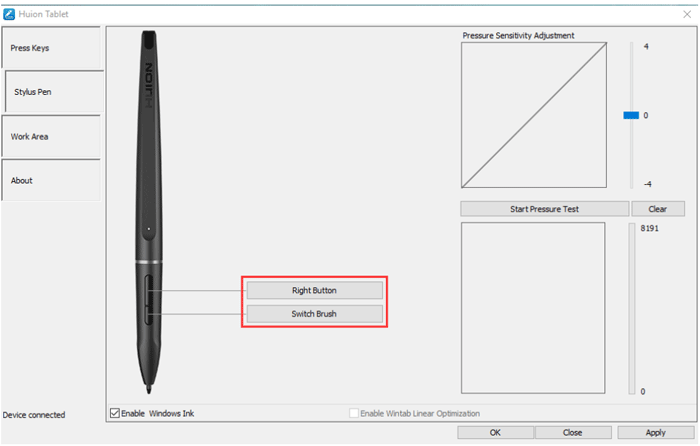 Especially that similar pen displays has dedicated buttons for OSD. KAMVAS GT-156HDV2 supports 8192 level of pressure sensitivity, this is the standard pressure levels you see in pen displays & graphics tablets nowadays, both from Wacom & its competitors. I won’t say that having a lot of pressure is very important, even a pen display that supports 2048 pressure levels is adequate. In all fairness, some artists report that the additional pressure levels makes difference, but I can’t see that from a technical point of view. I think we already have more pressure than we actually need. Pressure sensitivity is mostly used as a marketing ploy. The only case you should upgrade if you’re using a table tor pen display with very lower amount of pressure, like 512 or something. I have discussed this in more details in my book Getting started with Wacom graphics tablet and Digital Painting With Photoshop. There’s no tilt support in KAMVAS GT-156HDV2, but that’s not something to care much about if you’re new to digital art (Though it’s something you better try yourself to see if you should care about it or not). KAMVAS GT-156HDV2 has parallax, which is a common problem with pen displays like that. Parallax, in case you don’t know about it, is a slight offset between the pen tip and the strokes you draw on the screen. This offset is often caused by the distance screen glass, and the thicker the glass, the more parallax you get. 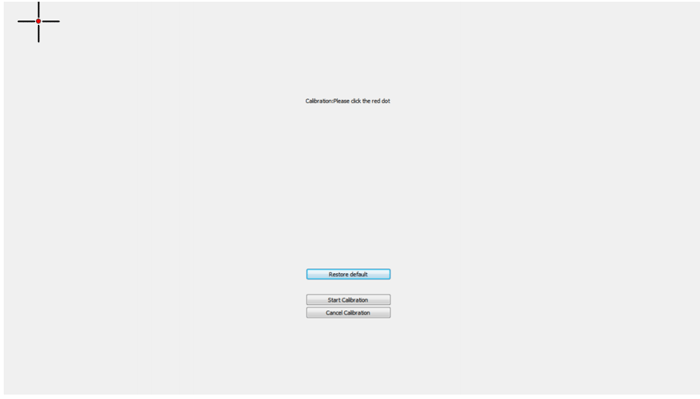 It’s worth noting that parallax is especially noticeable near the screen edge. Calibrating the display can make parallax less annoying, and you will get used to it after using KAMVAS GT-156HDV2 for a while. KAMVAS GT-156HDV2 has 12 programmable hot key in them, as well as a touch bar. Making a totally of 14 keys. The large number of hot keys makes it more possible to avoid using the keyboard if you want. Even then, some artists would prefer to use the keyboard, especially if you need much more than the available 14 key combinations. If you opted to use the hot keys, you can place KAMVAS GT-156HDV2 on your lap & draw to your heart content. Hot keys is something the bigger version of Huion KAMVAS GT-191, which I reviewed here, didn’t have, despite the fact that both were released in the same year..
By default, the touch bar zooms in & out the canvas, but you can customize it to scroll or do other things from the driver options. You can also disable the touch bar if you think it will hinder you. I wanted more pen displays to have convenient cables like this one, as they make it easier to connect pen displays to your computer. The only downside in such cables is that you’re limited to the length they provide you. Using extension cables may help you there. KAMVAS GT-156HDV2 comes with not just one pen, but two. each of the pens has two buttons on the side, which is pretty much a standard in most drawing pens these days. Just like the hot keys, you can customize these two buttons to do what you want. Since none of the pens has an eraser at the other part (that’s where you plug the pen charging cable), configuring one of the two buttons to make it switch to the eraser tool is one idea I suggest (I personally use buttons like that for undo & redo typically). 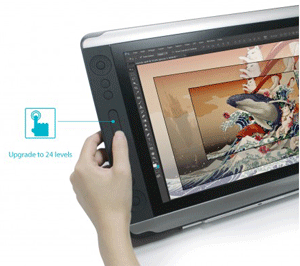 Having two pens is one of the common things with Cintiq alternatives like KAMVAS GT-156HDV2. While you can use one while the other is charging, you will rarely need to do that, as the pen battery lasts for too long. Also, having two pens can be useful in case you lost one (Twitter is full of tweets about people losing their pens, so it’s a bit more common than what you may think). 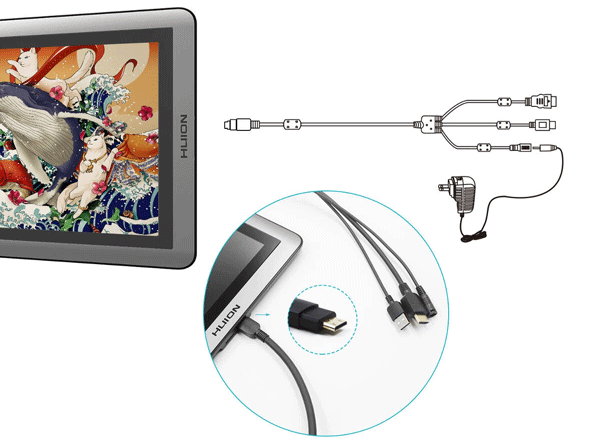 You charge the pen using the charging cable that comes with KAMVAS GT-156HDV2. Besides the pen, you get replacement nibs in case the pen nib wore down. It’s important you change the nib once it wears down to avoid hurting the surface of your screen. You remove the nib using the nib remover ring (also comes with the pen). The amount each nib lasts depends mostly on the pen display surface, as well as how much you press the pen on the screen while you draw. For more information on how much each pen nibs last, refer to my post How much Wacom nibs lasts? And how to make your graphics tablet nibs last longer. There’s no VESA mount at the back of KAMVAS GT-156HDV2. So far, I have noticed that small pen displays like this are usually not compatible with VESA mount, you may be able to mount it to an arm or any VESA using braces & other means. That’s especially the case since KAMVAS GT-156HDV2 is thin enough. You may get into some weird issues while you install KAMVAS GT-156HDV2’s driver, while these issues can be solved if you tried hard enough (assuming your unit itself has no hardware issues), it’s better not to run into any of these problem. One of the things you really should do for that is to remove any graphics tablet driver you have installed on your computer, Wacom or not. Such drivers can totally conflict with KAMVAS GT-156HDV2’s driver, and they produce some issues that can be hard to solve otherwise. 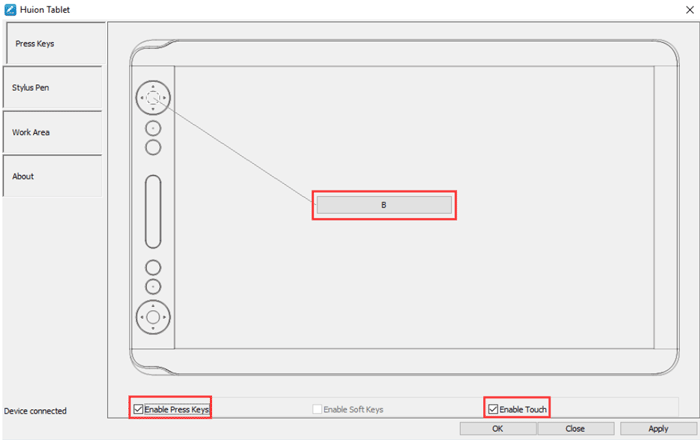 I have the habit of visiting the manufacturer site every time I review a graphics tablet or pen display, just to see what driver versions are made available for you to download. From what I saw, you can only download the latest driver from Huion’s site, and besides the driver that comes with the CD, you can’t have any of the older versions of KAMVAS GT-156HDV2’s driver to try them in case you got into a weird driver issue. KAMVAS GT-156HDV2’s driver offers you many options to customize it & change the way it works to help you draw better. Getting to know more about it can save you a lot of time, especially when it comes to customizing the hot keys. 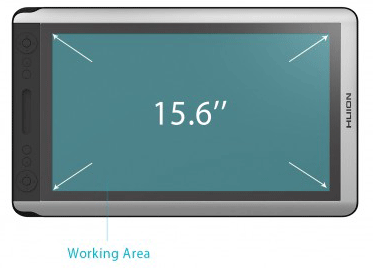 The work area is where you map KAMVAS GT-156HDV2’s screen, and it determines which screen is mapped to the screen area. That option may not be very useful, but know about the “Select current display” is important when you encounter certain issues. The rotate option is one where you know about if you’re a left-handed person (you need to rotate it by 180° in that case), as you want the hot keys to be at the right of KAMVAS GT-156HDV2 while you work. One of the good sides of the driver is that it allows you to adjust the pressure curve, some similar products, like Huion KAMVAS GT-191, don’t have an option like this. The ability to adjust pressure curve can make it possible to draw easier once you discover the best settings for you, as opposed to have a one size fits all. Besides adjusting the pressure curve, you can also adjust the pressure sensitivity, so it requires you to either press too much to get thick lines, or to press very lightly. It all drills down to your preferences. Some artist want strokes to appear with the slightest pressure with the pen, while some others prefer to press harder. The default settings may be enough for most artists, but it won’t hurt to experiment a bit. 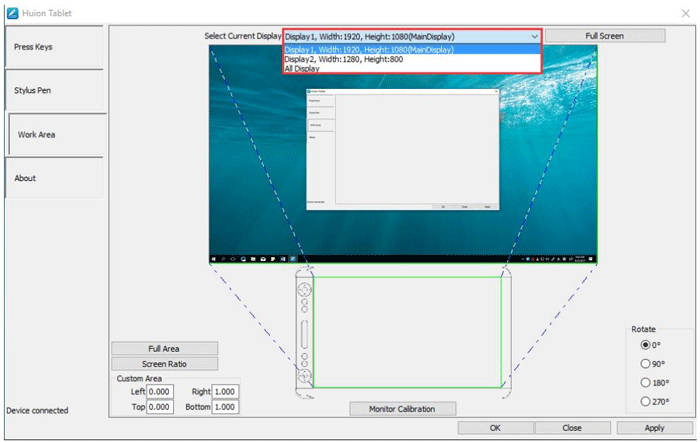 The calibration screen is where you calibrate the screen, something you should do in order to you get less parallax. KAMVAS GT-156HDV2 is one of the best pen displays in that size I reviewed so far. It looks good, and offers a lot of features for the price. The sleek design & the high numbers of hot keys makes them slightly better than some of the other pen displays. The stand could be a hit or miss for you though. Same for the colors (unless you know what you’re getting beforehand, the colors of KAMVAS GT-156HDV2 are generally good, but not extraordinary). I don’t’ claim you won’t have any issues of you decided to go with KAMVAS GT-156HDV2, especially if you have Wacom drivers installed on your computer, but the price of this pen display makes it really worth trying (the same case with many of the other similar pen displays).